Iberis can be grown as either hardy annuals or perennials in the garden; this page of plant biology advice provides information on how to grow the annual varieties of Iberis. For perennials see this page: Perennial Iberis. Plants reach from 30 to 40 cm in height, making them good for use in rock gardens and at the front of garden borders. They flower from early summer to the first frost of winter if you sow them sequentially. 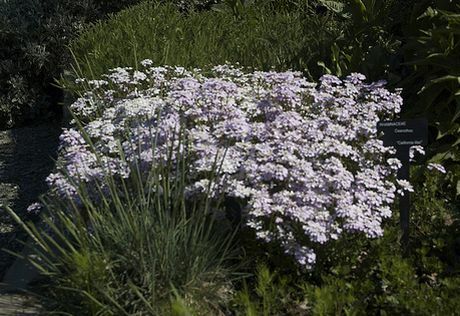 Iberis has lance shaped leaves and fragrant umbels of flowers that may be pink, red, purple or white in colour. Some of the common names for Iberis include Annual Candytuft, Rocket Candytuft, Iberis snowflake, and Globe Candytuft. Latin names include Iberis sempervirens, Iberis umbellata, Iberis amara, and Iberis gibraltarica. Iberis gibralterica - Gibraltar candytuft by Old Itch; creative commons. Growing Region: Annuals: zones 1 to 10. Perennials: zones 3 to 10. Flowers: Annuals: summer until first frost. Perennials: spring. Flower Details: Purple, red, white, pink. Umbels. Racemes. Fragrant. Foliage: Lanceolate. Evergreen. Dark green. Annuals: 1/8 inch (3mm). Sow every ten days from the last frost until the end of summer. Spacing 8 to 10 inches (20 to 25 cm). Perennials: 1/4 inch (6mm). Before the last frost or in autumn. Spacing 8 to 24 inches (20 to 60 cm). Use peat pots. Germination time: two to six weeks. Temperature 70 to 80°F (21 to 27°C). Six or seven weeks before expected last frost. Transplant outdoors following the last frost. Requirements: Full sunlight or partial shade. Good drainage. Soil pH 6 to 7.5. Average soils. Perennials prefer a richer soil. Regular watering. Light prune for prolonged blooming season/ to tidy up perennials. Propagate: Take cuttings from perennials following flowering. When growing Annual Candytuft outdoors from seeds they should be sown every 10 days or so. Start this sowing process from the last frost of spring until the middle of summer. The seeds of Candytuft should be planted at about 3 mm deep into a sunny part of the garden. Most Iberis species like to have a soil that is slightly acidic to neutral (pH 6 to 7) and good drainage; the soil type is not too important. If you want to first grow Annual Candytuft indoors, then start the process about two months before they are due to be transplanted in the garden (from the last frost until summer); put them out every two weeks apart for continuous blooms. It will take about two or three weeks to germinate candytuft seeds at a temperature of 21 to 30 degrees Centigrade. Once growing it is important to water annual Candytuft and other Iberis members regularly. It is best to let the soil become dry, then water again; and repeat this cycle. Following flowering a light trim will lead to more flowers, as soon as plants appear to be dying then remove them for the garden and replace with new Candytuft plants.